Discussion in 'The War at Sea' started by Tonym, May 30, 2015. Is there a remote possibilty that anybody has an illustration or photograph of the S.S. Tanjong Penang (Pinang) sunk in the Java Sea by Japanese in March 1942. Unable to find anything on the web. Do you mean Tanjong Pinang? It was a choice of Penang or Pinang but Penang appears most so I chose that and I did find the two items in your post and the first one includes a photograph that is in fact S.S. Kuala not T.P.. I have also since discovered that it was also classified as an H.M.T (His Majesties Transport) so it would appear that various people had their own identification. Hi Tony just a thought have you tried on Google,,,, picture of SS Tanjong Pinang. I tried it, but it may not be the one you are looking for. 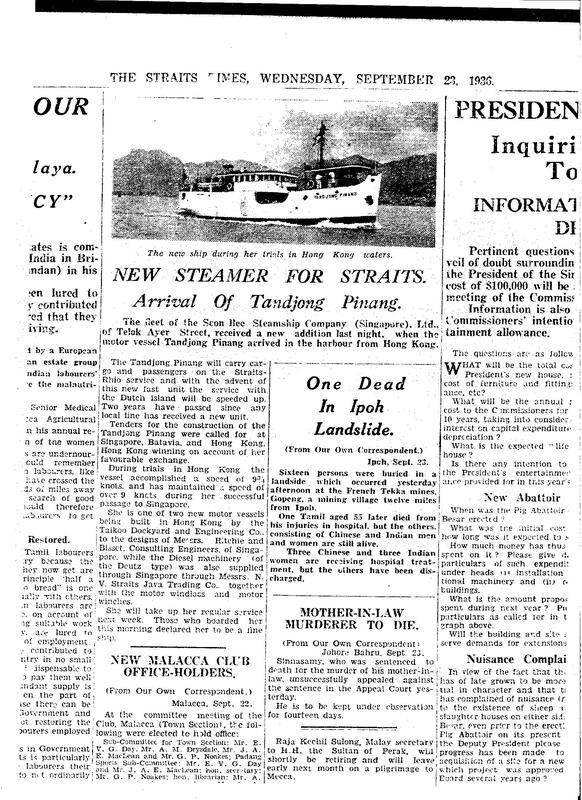 "The Story of the Tanjong Pinang' by David Wingate"
But the picture is not T.P.it is S.S. Kuala the vessel that the T.P. casuaalties were originaly on that was sunk off Pom Pong Island. To quote Lesley, I knew it would not be easy. I'll scratch my head some more and have a rethink. What surprises me is that so many, I don't know the figure, people died in the sinking of T.P. or in the Munseck Japanese concenrtration Camp on Banka Island, where some made it, that we cannot find an illustration of the vessel.??? One survivor of Munseck Camp, Nursing Sister Evelyn Turner, QAIMNS, who eventually made it back to Singapore, apparantly spent some years researching the incident but never discovered another survivor. It's a long shot Tony but, is there any way of finding out where she was built, who owned her or have you tried that route. Do you know what she was doing to be in the area at that time? Sorry if this is of no help just trying to think outside the box. Do you have the TNA file on the incident? Or is this the wrong ship?? I tried for the builder but no luck. Tanjong appears to be a successful holiday destination, plenty of hotels and restaurents and the location of the wreck bot no vessel photo. Thanks all for you efforts but It appears to be a lost cause. builder: Taikoo Dockyard and Engineering Co. Owner: Scon Bee Steamship Company (Singapore) Ltd.
CL1, 4jonboy and Enigma1003 like this. The power of the web and determined helpers !! The way to find out correct details of a merchant ship is to use the ship's official number. TANDJONG PINANG official number 159452, Port of Registry - Singapore, built in Hong Kong in 1936. Roy Martin and CL1 like this. Sorry should have answered your post earlier. I do have copies of all the pages relevant to the unfortunate lady that I was researching. My daughter went to TNA and photographed them. The cover of their file actually quotes "TANJONG PENANG" & "KUALA" so whatever the correct spelling I stuck to that. However I did get my lady accepted by CWGC for commemoration. Excellent result! so my challenge paid off.The only problem that I now have is trying to get a decent copy of the newspaper report, or at least a picture of the vessel. No matter what I try I cant get an appropriate image. The best that I got on a Landscape size word doc was only half the page of one article that included half the pic of T.P. - Any suggestions please. The only problem that I now have is trying to get a decent copy of the newspaper report, or at least a picture of the vessel. CL1, 4jonboy and Tricky Dicky like this.